I have attached a couple of boat photo's which may be of interest for your web site. 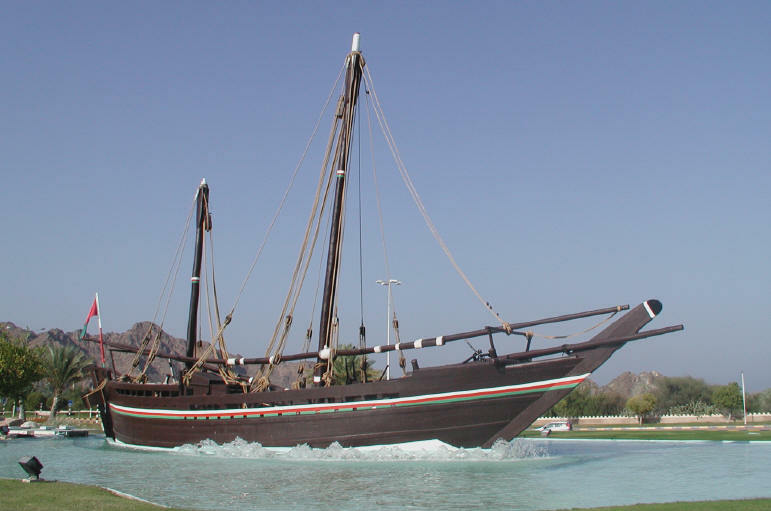 The boat is called Sohar and was built in 1980 as a replica of a traditional Arab dhow that traded from Oman to China, many centuries ago. This particular dhow was I believe, built for the British Explorer Tim Severin, who sailed it from Oman to China in 1980/81. Sohar now sits in the middle of a traffic island, just outside the superb Al Bustan Palace Hotel in Muscat, Oman, where my wife and I have just been for a winter sun holiday. gives some details of the boats construction and voyage, but it makes no mention of Tim Severin. I shall have to get a copy of his book and read up on it! I did manage to get a 1:1 scale sail in one of the hotel's Laser sailing dinghies, so can now say I have sailed in the Gulf of Oman! Got a great marine related photo?